The Chloe Flowerbox, CHLOE • by L’ATELIER KONTOR 202, came to life 3 years ago, designed and created by the team of KONTOR 202; Ivanka, Claudia and Holger Pittelkau. 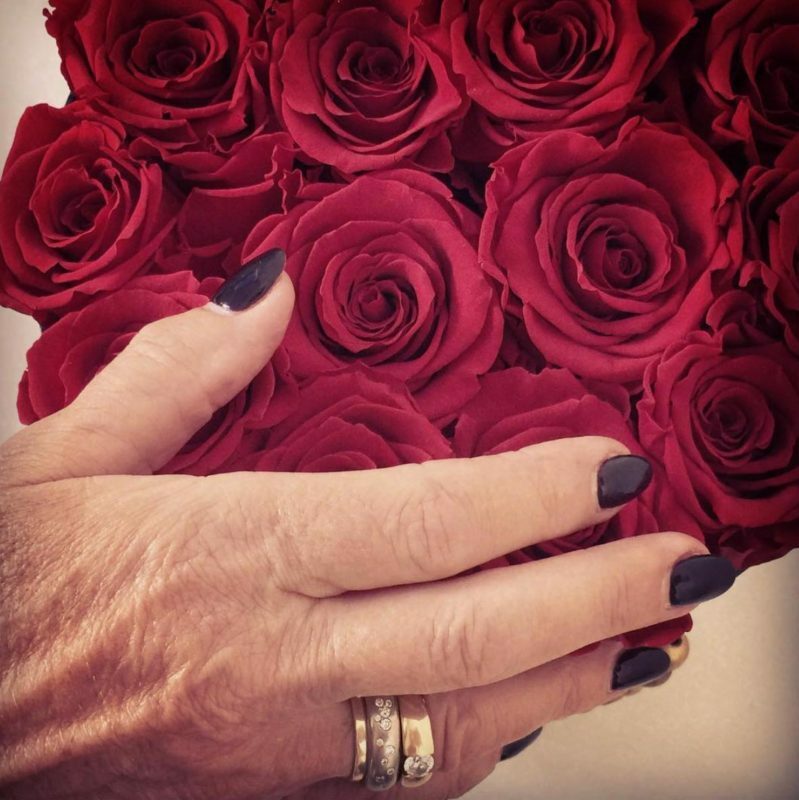 Named after the youngest member of the family, who is also the greatest inspiration for the brand, Chloe – meaning “blooming life” – is a fabulous definition for a Flowerbox filled with blooming, long-lasting Infinity roses. Since its inception the Chloe Flowerbox has been a successful work in progress. The Chloe Flowerbox is undergoing constant review and modification. From changes to the design, adjustments of sizes, improvements to the box material and finding the most suitable colours for Cyprus, everything is done with the aim to perfect it to its most luxurious state. 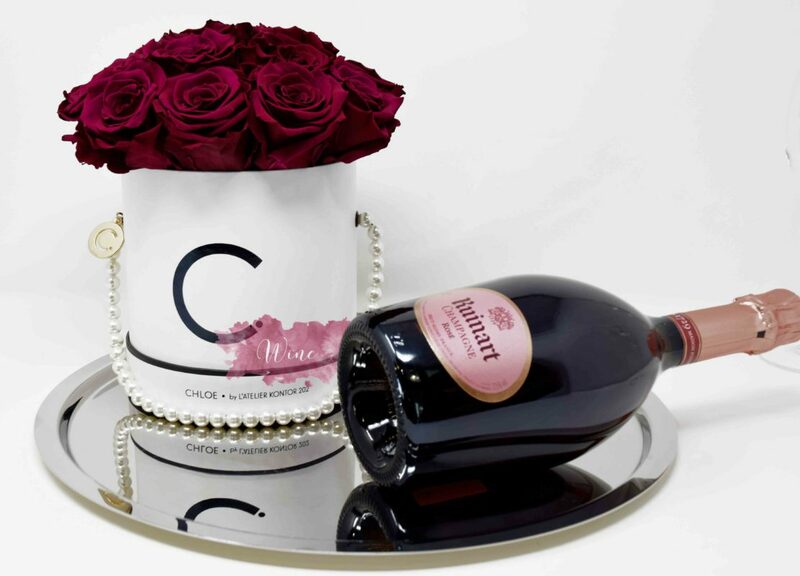 In case, at this stage, you are wondering what the Chloe Flowerbox is, it is a luxurious hat box that is filled with a blooming bouquet of preserved “Infinity” roses that can last up to three years. 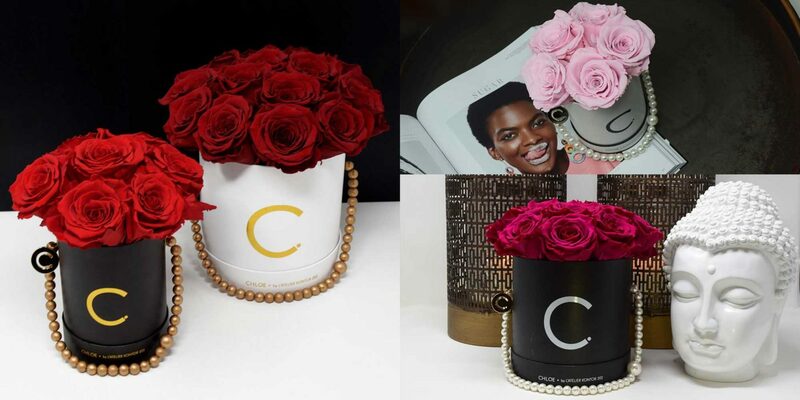 The Chloe Flowerbox is available in 4 different designs namely a white or black flowerbox with a flattering and elegant gold logo or a white or black flowerbox contrasted by a timeless black or white logo, respectively. The brands’ well-known “C•” is always placed on the front of the box and on top of the lid. In addition, the brands’ name is shown on the side of the lid. No CHLOE Flowerbox is original without the logo attached to or printed on it. 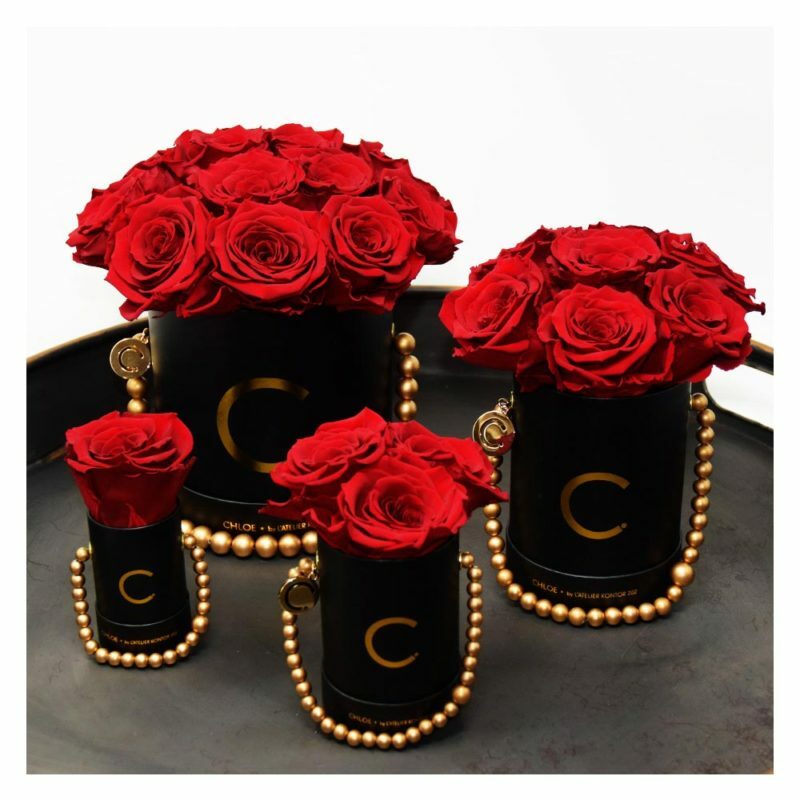 From a mini Chloe Flowerbox with a single Infinity Rose to an Extra Large Bouquet size with more than 25 Infinity roses you are sure to find the right flowerbox matching your budget or style. Driven by innovation and passion for design, the ability to adapt to differing customer wishes (& styles), the team at KONTOR 202 continuously designs new editions and combinations making the Chloe Flowerbox stand out as Masterpieces. You’d like a bespoke design? Just let us know and it will be done. Or would like your own vase or bowl filled with preserved flowers? Simply bring it in and receive design ideas and prices. There is a choice of 20 colours of Infinity roses available. You can therefore create your very own Chloe Flowerbox adapted to your interior style, personality or to a special day/event, for example. Wait, you can also wildly mix colours or opt for another colour of rose in the center to name just a few ideas. In the larger Chloe Flowerbox a letter or a special sign can be included, at a low resolution though. 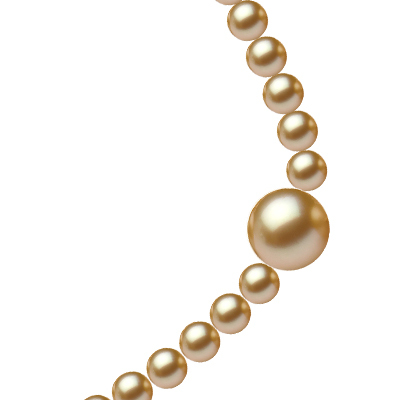 “Pearls are always appropriate” ~ by Jackie Kennedy. Every Chloe Flowerbox is finished off with a hand-threaded elegant pearl chain that is available in 16 different combinations and even more if you’d like something even more bespoke. “It’s all in the detail!” ~ The brand’s guiding principle. 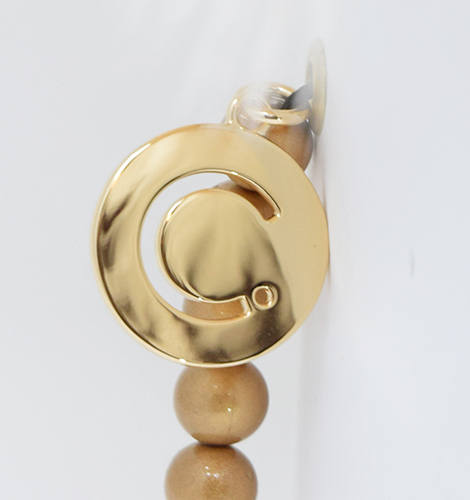 Every Chloe Flowerbox, except for the Mini, is adorned with an in-house created “C•” charm in either gold or silver at the end of the pearl chain, hanging from the side of the Chloe Flowerbox. 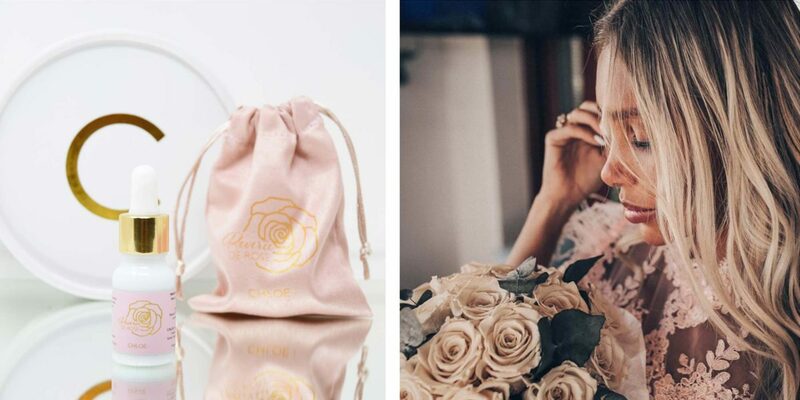 CHLOE Infinity roses do not only bloom 50-100 times longer than fresh cut roses, they also smell as roses should do and that much longer too thanks to the brand’s signature Infinity Rose perfume, “Reverie DE ROSE”. Just a few drops of “Reverie DE ROSE” will make your roses smell like garden roses and fill your rooms with its subtle, stimulating scent. You can naturally opt not to have them scented too but if you wish your roses bouquet scented, the first application is free of charge! The Chloe Flowerbox is water & stain resistant, provided it’s not soaked or left in the stain and it should not be acidic. A special lamination chosen for the outer shell of the Chloe Flowerbox allows you to simply wipe it clean should you manage to spill wine, coffee or anything on it. Although preserved, the roses are still real and needless to say they do change with time. Like we all do when we get older, preserved roses have the tendency to shrink. This is not as widely known as you would think. You often see the ugly green stuffing or plastic stems in between the beautifully blooming Infinity roses. In every Chloe Flowerbox you will find the highest possible ratio of Infinity rose to box space. Quality is knowledge, and knowledge is quality! We leave this for you, as the reader, to judge. CHLOE • by L’ATELIER KONTOR 202, commonly known as the Chloe Flowerbox, is the in-house brand of KONTOR 202. 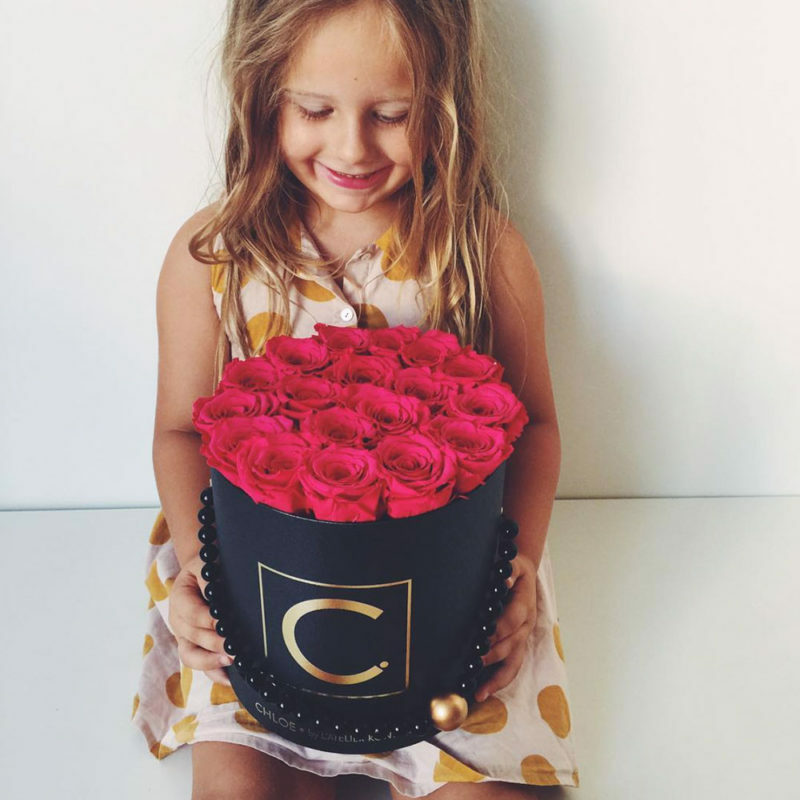 The Chloe Flowerbox is a luxurious, handmade hat box that holds our beautiful of highest quality Ecuadorian Infinity Roses, handpicked at the height of their bloom and meticulously preserved to last up to 3 years. Designed and conceived by us. The Chloe Flowerbox serves as a gift and as an interior design statement piece and best of all there is no longer a need to source a vase. This entry was posted in Preserved "Infinity" Roses. Bookmark the permalink.